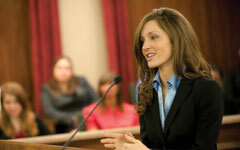 Washburn University School of Law is a public law school that offers a curriculum that combines classroom instruction with real-world skills and experience. If you are seeking an environment where a well-rounded legal education begins with a nationally recognized faculty and a student body that ranks among the highest in student satisfaction, Washburn Law is an excellent choice for you. For more than a century, Washburn University School of Law has demonstrated its commitment to academic excellence, innovation, and diversity. Consider the many opportunities that Washburn Law offers. Visit us and experience the law school for yourself. We look forward to being a part of your success. "Looking back over the past three years, I can say that attending the Washburn University School of Law truly has been a privilege. "Like so many other things in life, law school goes all too quickly. There is so much to learn and so much to do in only three short years. And, although it is a whirlwind, Washburn Law helps you make the most of it. "From its location in the capital city—exposing you to tons of internship and externship opportunities—to its nationally ranked legally writing program, Washburn provides its students with a foundation for success. "Being a third generation Washburn Law graduate, I knew that I would receive a great education at Washburn Law. What I did not realize is that the most distinguishing feature about Washburn Law is its people. From its students to its faculty, Washburn provides a wonderful support system that pushes you to aim high, supports you when you fall, and celebrates your successes. "I am so thankful for the wonderful people I have met and the experiences I have had as a result of attending Washburn University School of Law, and I am proud to be a part of its wonderful tradition."